Xmas (or XXXmas? 😉 ) is around the corner, so we thought it’s the best timing to announce our next contest. 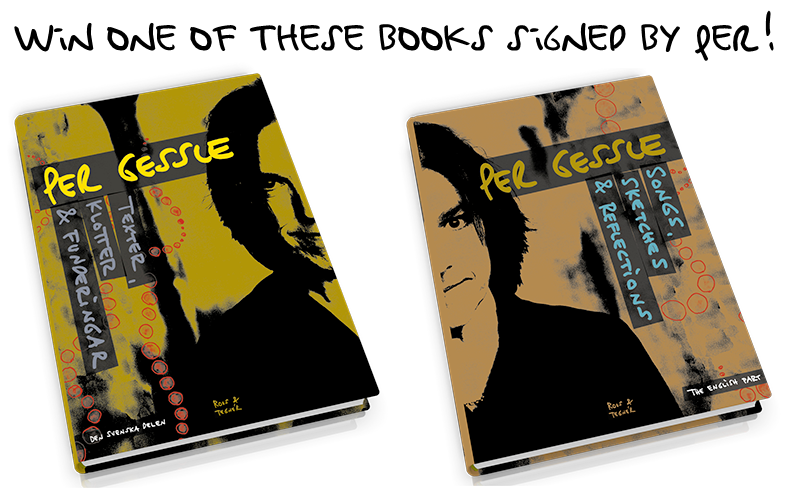 Huge thanks to Roos & Tegnér (publishing company) for offering Per’s 2 books for us to give away. Since we were there at the Göteborg Book Fair, we had the chance to make both books signed by the man himself. Besides Mr G’s artistic autograph, you’ll find a tiny message in the books, too. 2 winners will be picked. One of them wins the English book (Songs, Sketches & Reflections), the other the Swedish book (Texter, klotter & funderingar). We will do our best to mail the books as soon as possible, so that they can land under 2 Christmas trees in time. Which books Per didn’t want to compete with, so he decided to publish 2 books instead of 1 thick book? Who did that interview with Per which can be found in both the English and the Swedish book? What does Per say, why doesn’t he want to talk too much about his own songs? Name at least 2 songs of other artists that have brilliant lyrics according to Per! Send an e-mail with your name, home address (so we can send the book in case you win) and the answers to the questions to rxbcontests@gmail.com until 23:59 CET, 3rd December 2014. The 2 lucky winners will be announced a few days later. Patrícia and Judith and the rest of the RXB Team. – In order to participate, you have to send an e-mail to rxbcontests@gmail.com with name, address and answer to the 4 questions. We will consider all e-mails we receive until 23:59 CET on 3rd December 2014. – 2 winners will be picked randomly among those who have participated and sent the correct answers. The 2 books will be picked randomly for the 2 winners. – Prizes won’t be paid out in cash. Prizes will be sent by standard mail only once (so basically, if the package gets lost, we won’t be able to send a replacement). The lucky winners are: Caroline Wiltz Delorme, Mexico (Swedish book), Mathew James, UK (English book). The winners have been informed via e-mail and were announced on our Facebook page.